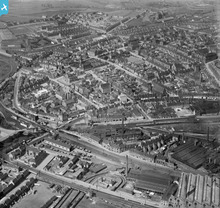 [SPW027204] Coatbridge, general view, showing Coatbridge Cross and Sunnyside Road. An oblique aerial photograph taken facing south-east. 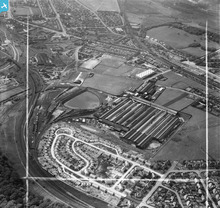 [SAW030006] Coatbridge, general view, showing Stewarts and Lloyds Ltd. Calder Tube Works and Victoria Iron and Steel Works. An oblique aerial photograph taken facing west. This image has been produced from a crop marked negative. 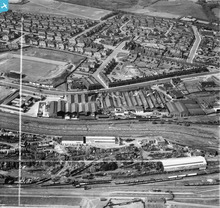 [SAW029963] Coatbridge, general view, showing Stewarts and Lloyds Ltd. Works, Main Street and Albion Rovers Football Ground. An oblique aerial photograph taken facing north. This image has been produced from a crop marked negative. 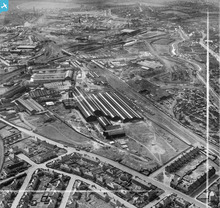 [SAW029954] Stewarts and Lloyds Ltd. Imperial Tube Works, Coatbridge. An oblique aerial photograph taken facing north-west. This image has been produced from a crop marked negative. 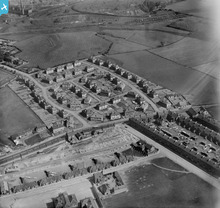 [SPW027209] Coatbridge, general view, showing Calder Avenue and Whifflet Street. An oblique aerial photograph taken facing south-east. 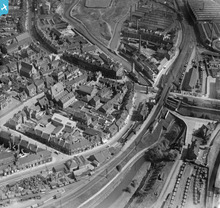 [SPW027207] Coatbridge, general view, showing Main Street and Gartsherrie Parish Church. An oblique aerial photograph taken facing north-east. jaypea	added a pin to image SPW027204 - "Town brass band practice hall"